18th c, Sophora wood, Shanxi. Original ironwork, double locking mechanism preserved, supporting legs from centuries old wood, solid and heavy. 53″ w, 33.5″ d, 19.75″ h.
There is no “coffee table” in China. This historical piece makes a magnificent one suitable for any setting, traditional or contemporary. Since China has banned any ancient building structures, e. g. carved structural wall elements, stone building support bases, and any over 150 years old relics from leaving the country, this manor or castle door is rare and valuable. Reproductions imitating this kind of door and even carved and decorated barnyard doors have been shown to cost $7500 to over $15,000! This door is extremely solid and heavy. It retains its double locking mechanism —a metal slide from the exterior and a wooden brace from the interior. This is a strong feudal period castle door protecting the manor house from outside attacks. The wood used in the construction of this door is attributed to Sophora rather than Northern Elm (in same family) because of its density and deep grain pattern, a characteristic of this wood that became extinct after the Ming period because of the tree’s extreme slow growth and over-used as furniture building material during that early period. The single wood plank is at least two inches thick showing beautiful deep grains. The iron decorative pieces are also thick and strong, all hand fashioned. This is an authentic antique door from an old country with much history and is not to be confused with a reproduction of a past period style. 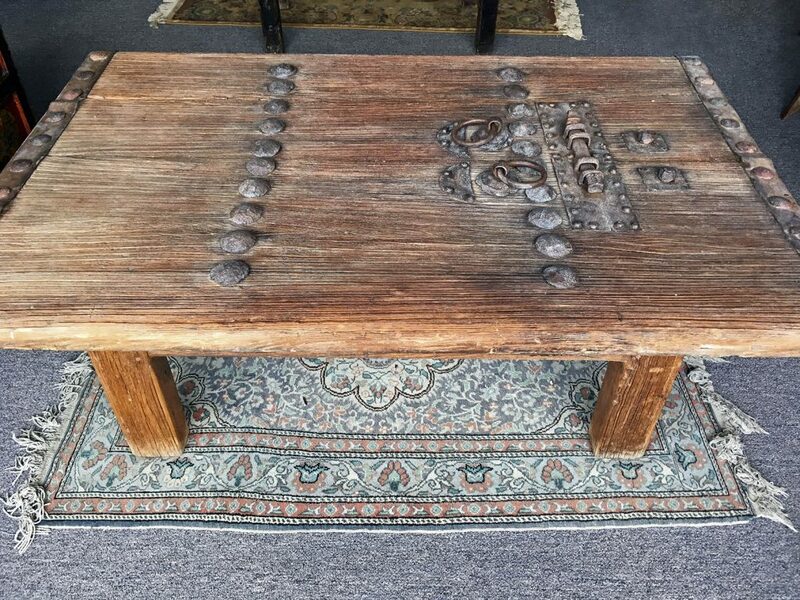 For modern-day use, the door has been transformed into a coffee table by adding legs to it; even so, the wood making the legs is several hundred years old and is very dense and heavy. The table is crafted in China in the traditional mortise-and-tenon construction, with tenons showing. This table would add distinction to a room it is placed in, especially one in an alpine setting.